Oklahoma: No reports of significant diseases in Oklahoma. Around Stillwater, wheat soilborne/spindle streak mosaic are still showing strong in my screening nursery, but these virus diseases should not be much of a problem around the state due to resistance in nearly all planted varieties. Looking in the same places as 10 days ago, I did find a slight increase in the number of powdery mildew pustules on low leaves, but these pustules still are small and did not appear to be actively sporulating. Wheat is mostly at the Feekes stage 6 but likely approaching stage 7. Many thanks to Dr. Amir Inbrahim for sending the report below as this is the most comprehensive disease report I have heard to date from Texas. I interpret his observations to indicate that both stripe and leaf rust are present (especially leaf rust), but that build-up has not yet hit the upper canopy but in this area producers should be ready to “pull the trigger” to protect wheat with high yield potential. In Oklahoma we will need to wait and see if moisture comes to allow inoculum coming from southern Texas to infect the Oklahoma wheat crop. Texas Dr. Amir Ibrahim (Prof, Small Grains Breeding and Genetics, Texas A&M University) 30-Mar-2014: I have received reports from our research associates, around March 26, 2014, about the rust situation in South Texas. Castroville, TX: The wheat crop is now at Feekes growth stages 8-10.5. Cultivars such as ‘Everest’ and ‘Billings’ have already headed at this site. There is a uniform spread of leaf rust (P. triticina) in the lower canopy of the spreader rows throughout the field. The infection has not yet moved up into the middle canopy or the flag leaves. It has been raining during the week of March 24th, and the weather forecast calls for temperatures in the high 80’s for the next few days, which will help promote the spread of the infection. 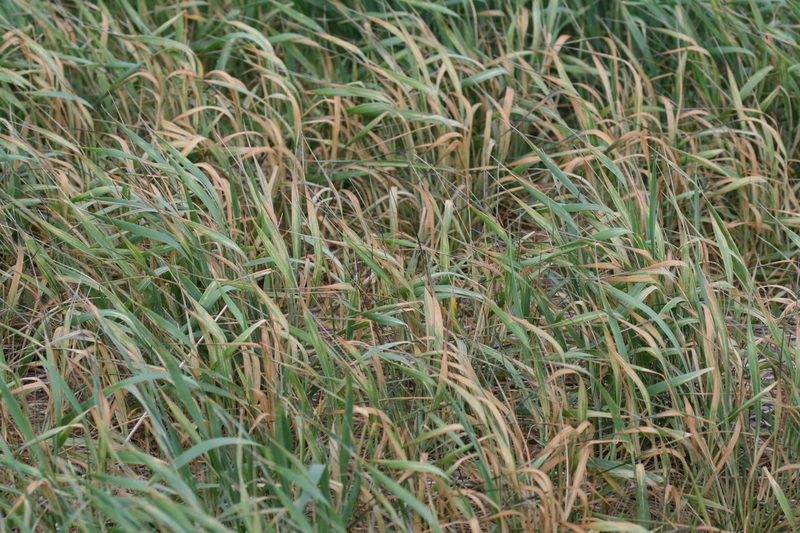 Stripe rust (P. striiformis) has spread throughout the replicated trials, especially on the spreader rows of ‘Patton’. The infection was as high as 60S on the flag leaves of some experimental lines. There is uniform spread on TAM 111 in the range of 20-30S, which points to the presence of 2012 virulence. Temperatures have been cooler than normal which helped the spread of P. striiformis at this site. However, the warming temperatures will slow spread at this site but not necessarily at sites farther north if infection has already started. Wharton, TX: The Wharton uniform rust nursery is located 90 miles south of College Station. The wheat crop is now at Feekes growth stages 8-10.5. ‘Everest’ has already headed at this site. There is a uniform spread of leaf rust in the lower canopy of the spreader rows throughout the field. The infection is beginning to move into the mid canopy, and we believe mid-April should be a good target date for taking readings at this site. Beeville, TX: Beeville is located 50 miles NW of Corpus Christi. 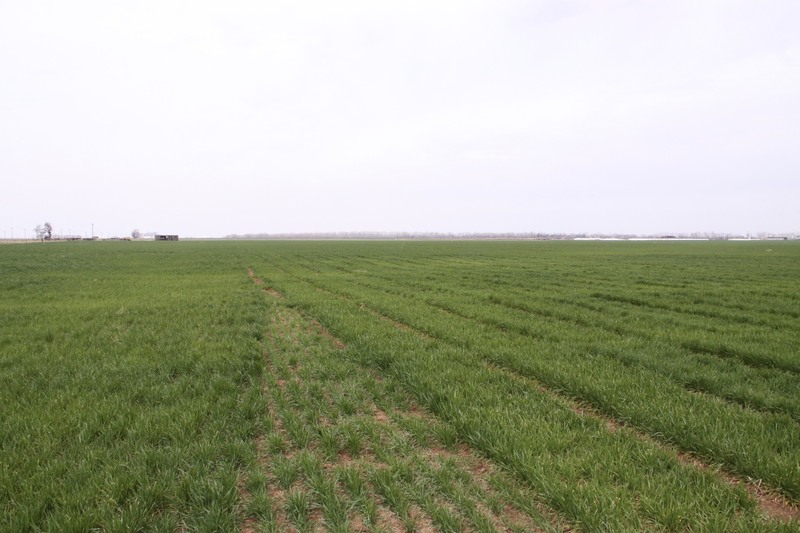 We have both spring and winter wheat plots and head-rows at this site. The majority of the winter wheat here is at Feekes 5-7 growth stages, whereas the spring wheat is at 9-10. There is a buildup of leaf rust on TAM 112 in the head-rows and on the spreader rows around the yield trial plots. College Station, TX: The wheat at this site is at Feekes 7-9 growth stages. There is a buildup of leaf rust in the lower canopy of ‘TAM 110’. With the exception of Brawl CL Plus, Centerfield, and a few experimental lines all of the varieties in our plots at Stillwater are at first hollow stem. I have posted the measurements from 21 March 2014 below. Oklahoma: Diseases are still quiet across Oklahoma. 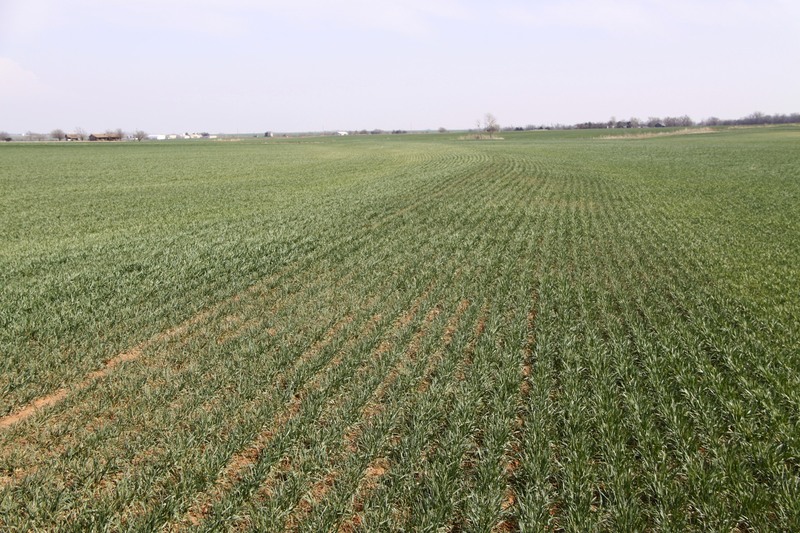 Gary Strickland (Extension Educator – southwest Oklahoma) indicated he has “seen one leaf rut pustule.” Also, wheat just has not grown in his area and is just starting to get to the point of tillering but there is so little growth he doesn’t feel there is sufficient growth to support much tillering. 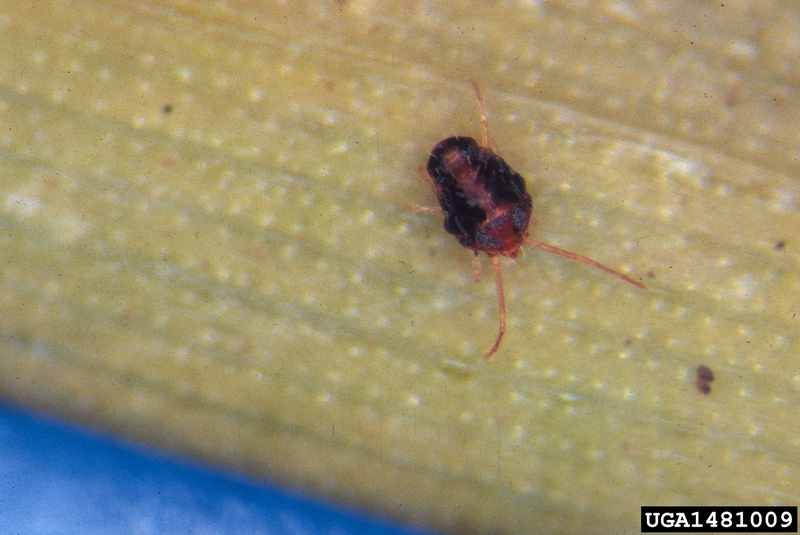 He did indicate he has seen and has a lot of reports of brown wheat mites. Around Stillwater, the wheat soilborne/spindle streak mosaic is the only disease of prominence. I did find some small pustules of powdery mildew in the extreme low leaves of ‘Pete’ wheat that was in the range of Feekes 6. Wheat around Stillwater is in much better condition than in western Oklahoma where drought has been severe. I also have seen quite a few lady beetles in my trials and plots, but have yet to see any aphids. 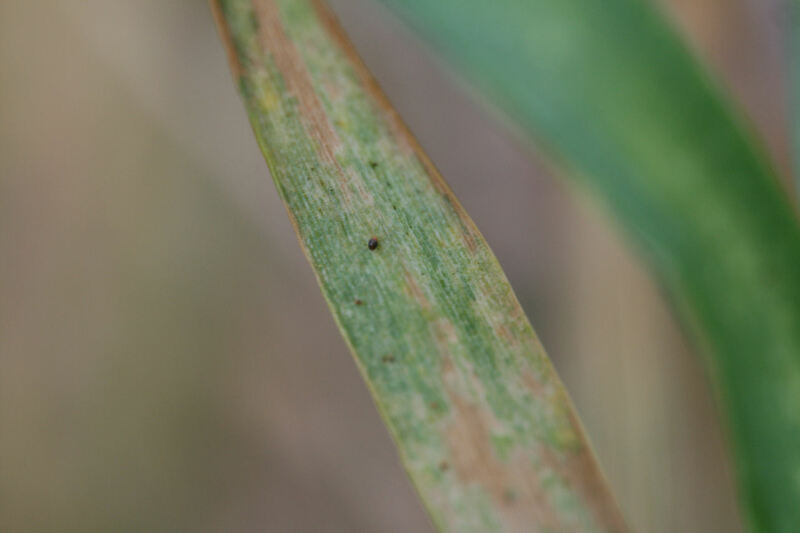 Arkansas Dr. Gene Milus (Professor/Wheat Pathologist, Univ of Arkansas) 20-Mar-2014: Jason Kelley, Extension wheat agronomist, found fresh leaf rust pustules on volunteer wheat at the Cotton Branch Experiment Station near Marianna on March 20. Louisiana Dr. Stephen Harrison (Professor/Wheat Breeder, LSU AgCenter) 18-Mar-2014: I found leaf rust at the Ben Hur Research Farm in Baton Rouge yesterday. This was in an early-planted field for Hessian Fly where I found a few pustules around Christmas. The cold and very wet winter put the rust on hold until recently but it is active and should ‘take off’ now. I have not received any other rust reports from around the state but will check nurseries in north Louisiana tomorrow. The wheat crop is a little later than normal and has a much tighter range of heading dates due to the cold winter. The variety trial probably averages second node but is very rapidly developing. Most wheat varieties are now at first hollow stem in our plots at Stillwater. I have posted the measurements from 18 March 2014 below. 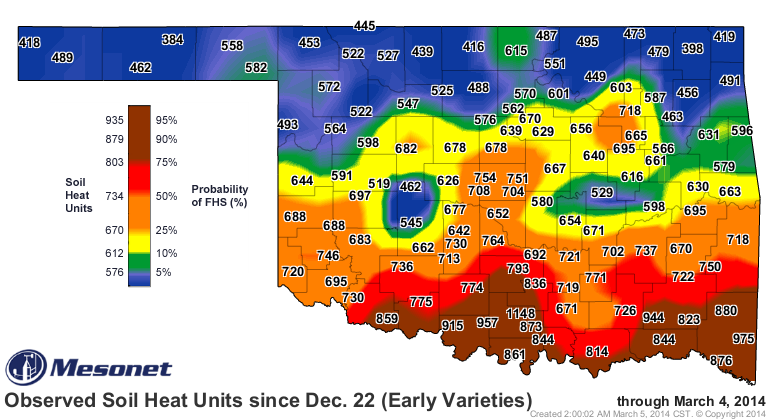 Oklahoma: No foliar diseases of significance to report in Oklahoma. 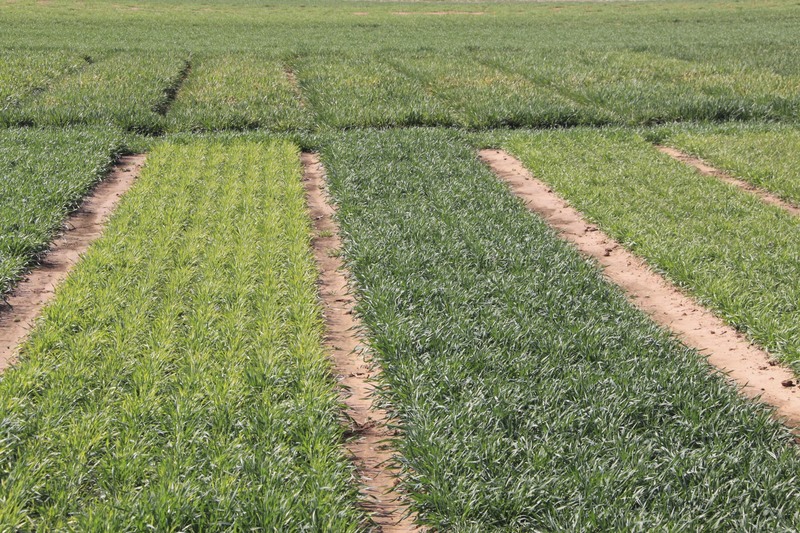 Wheat is mostly just coming out of dormancy, and cold/dry conditions have not favored initiation of foliar diseases. My soilborne/spindle streak nursery is starting to show symptoms of these virus diseases. The wheat is just starting to “green-up,” so symptoms of this virus complex will become evident over the next couple weeks if a susceptible variety was planted in areas where these diseases are present. Texas Dr. Amir Ibrahim (Prof, Small Grains Breeding and Genetics, Texas A&M University) 07-Mar-2014: Our rust evaluation nursery was planted at Castroville, TX, about 12 miles west of San Antonio. The wheat crop is now at Feeks stage 7‐9. There is a mild buildup of leaf rust (Puccinia triticina) in the lower canopy of the spreader rows throughout the field. At this time last year, leaf rust was already 50S on ‘TAM 110’. 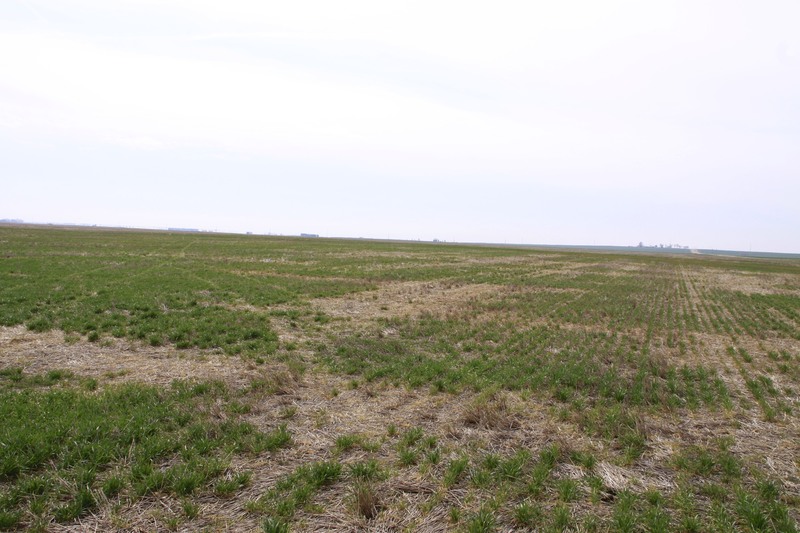 The unusually cold weather that we have encountered this year did not favor rapid spread, but the disease seems ready to move if the weather starts to warm up. Stripe rust (Puccinia striiformis) has been detected on some plots located in the middle of the field, and is mostly limited to a 600 ft2 area. Night temperatures for next week will range from 39 – 48 F, which will favor new infections by urediniospores and pick up in sporulation. WB-Cedar and Sy Llano reached first hollow stem this week, and there are several additional early-maturing varieties that are near first hollow stem. The results from a March 13 sampling of plots are posted below, and we will post results from another sample early next week. 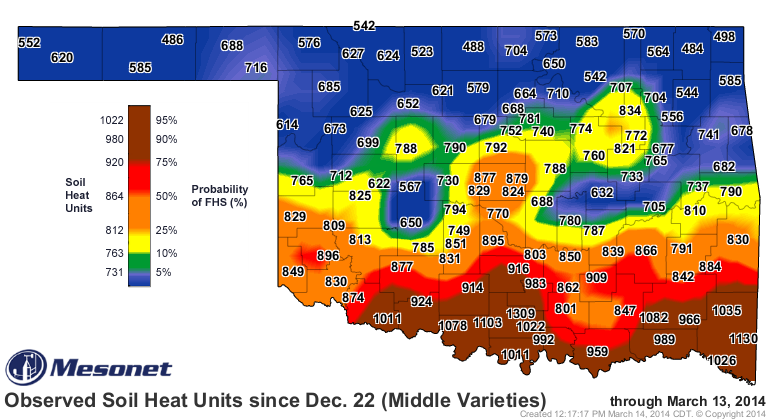 I have also posted the map from the Oklahoma Mesonet’s First Hollow Stem Advisor for medium maturity varieties. 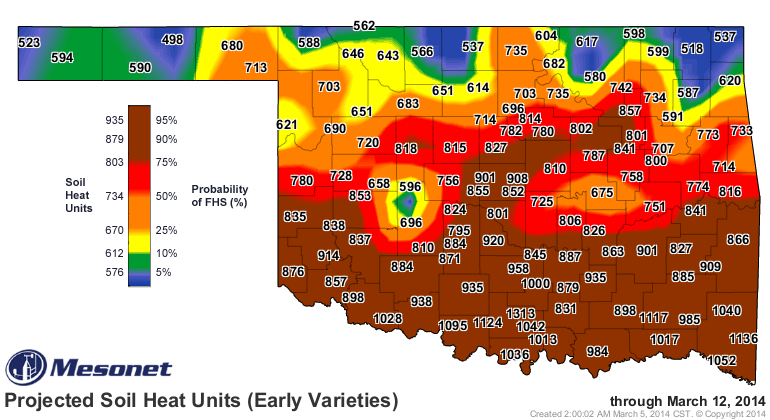 As indicated in the map, most wheat south of I-40 is likely at or past first hollow stem. 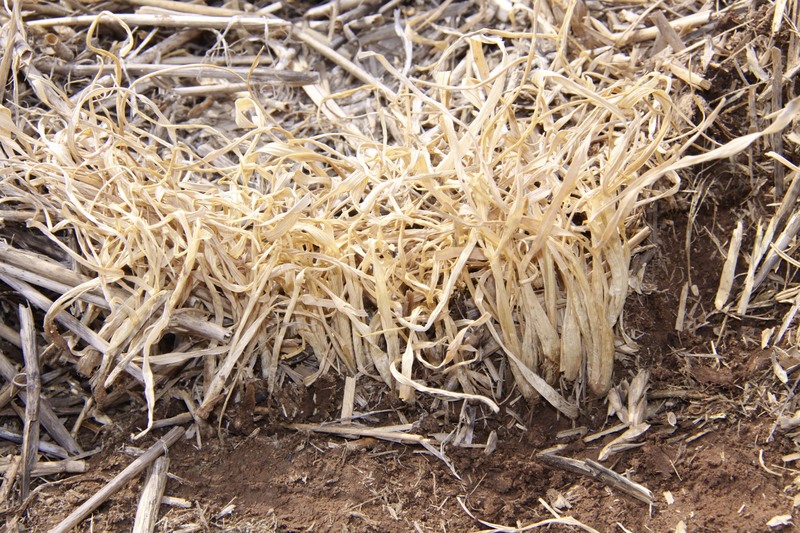 First hollow stem works as a pull off date for cattle on wheat pasture because it allows the plant a small amount of time prior to jointing to recover some of the green leaf area lost to grazing. As evidenced by the results posted on this blog, first hollow stem is running a good 1.5 to 2 weeks later than normal. Given the situation, it is advisable to consider removing cattle from wheat pasture sooner rather than later. In many cases this would be before the occurrence of first hollow stem. I make this recommendation because once our temperatures start to warm, it is likely that that wheat phenological development will proceed in rapid fashion. 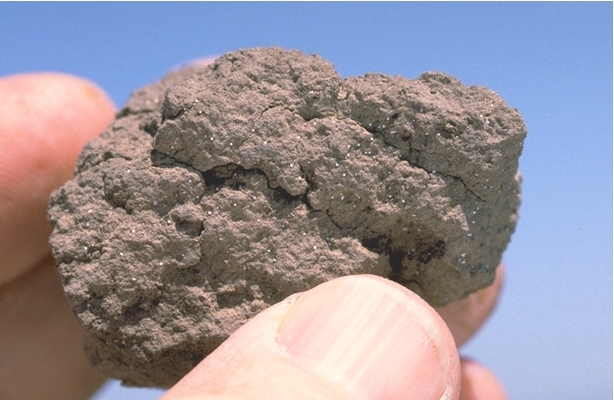 We could easily encounter a situation where there are only a few days separating first hollow stem and jointing. Pulling cattle from wheat pasture a little early will allow extra time for recovery, which might be needed this year. With the exception of one experimental line, there are still no varieties at the first hollow stem stage of growth at Stillwater. The results from a March 10 sampling of plots are posted below, and we will post results from another sample later this week. First hollow stem works as a pull off date for cattle on wheat pasture because it allows the plant a small amount of time prior to jointing to recover some of the green leaf area lost to grazing. As evidenced by the results posted on this blog, first hollow stem is running a good 1.5 to 2 weeks later than normal. Given the situation, it is advisable to consider removing cattle from wheat pasture sooner rather than later. In many cases this would be before the occurrence of first hollow stem. I make this recommendation because once our temperatures start to warm, it is likely that that wheat phenological development will proceed in rapid fashion. We could easily encounter a situation where there are only a few days separating first hollow stem and jointing. Pulling cattle from wheat pasture a little early will allow extra time for recovery, which might be needed this year.